Sembalun Lawang Village is one of the most recommended destinations when conducting a vacation in Lombok Island. Not only it is located near to Rinjani Mountain, the village becomes the home of a famous local apple farm which is open for tourists and those who love nature. As the name suggests, the locals use the site for cultivating apples and promote it as a new attraction for tourists. On the location, visitors are allowed to pick the apples to their heart’s content after paying the fee. Also, they can explore the site wholeheartedly. As people may expect, the apple farm features mostly apple trees. The landscape is grassy and the nuance is quiet, actually. Somehow, it is similar to Malang’s apple farm but the size is not that wide. The land is fertile and the atmosphere is average so visitors would feel comfortable when exploring the farm for hours. Not to mention the scenery is quite amusing! Only several visitors are seen on the location during weekends and holidays, too, in fact. Despite the unpopularity, it completes another famous farm of Sembalun Village, which is the strawberry farm. 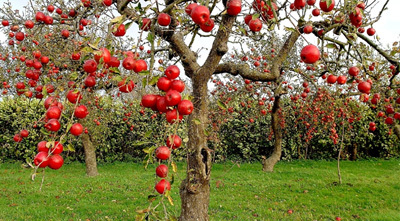 The Apple Farm of Sembalun becomes a good reference for those who are into agro-tourism. Somehow, the farm is suitable for spending a good time with families and friends too. They can pick the apples together and take some memorable pictures during the activity. After picking the fruits, they can either eat or bring them back home. What they only need to do is to pay the fee before enjoying such fun activity. Within the farm, there are around 50 trees and the fruits look so tasty and fresh! As for the tip, visitors should bring some money while visiting the farm. Have no worries. The fee is negotiable especially for those who come in a group. What about the facilities? Unfortunately, the farm doesn’t provide sophisticated facilities but tourists can use the owner’s toilet freely. For foreigners, it is better to hire a reliable tour guide during the visit. This man would help them to talk to the owner of the farm and conduct bargaining regarding the price. Another important consideration is regarding the best time to visit the farm, which is between May and September. Those times are the harvest time, so the fruits come in their best condition and tourists are allowed to eat them right away on the farm! One thing, lots of people come at those months so tourists should expect a crowded situation. Do not forget to carry some plastic bags to store the apples, as well. From Mataram City, what tourists need to do is to head to East Lombok Regency through Raya Mataram – Labuan Lombok Street. Later, they can simply head to Sembalun Lawang Village. The whole trip takes around 2 hours and 45 minutes as the distance is 84.7 km. It can be faster, though, if they use a better transportation service.